happy almost weekend, today i am collaboration with the amazing/talented rita from coast with me. 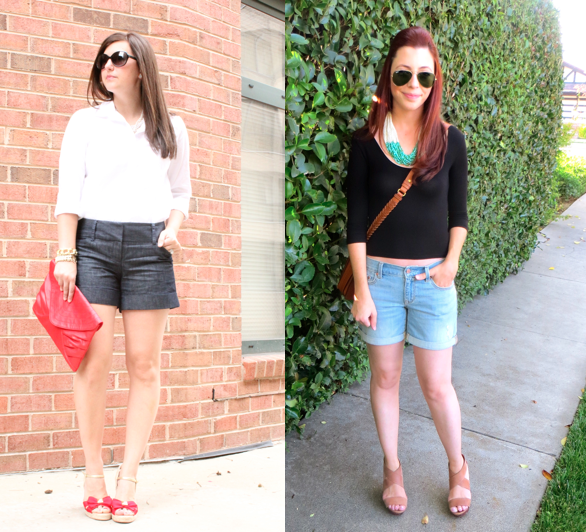 we decided to style denim shorts for the summer. showing there are so many more ways to wear them then one would think. dressing up shorts for brunch and a day on the town is easy when you add some wedges and a blouse. on the other hand it is great how rita styled her denim with a great crop top and wedges for a more carefree afternoon out and about. Those bow sandals are adorable! SO cute! Both looks are darling and both of you girls are beautiful!! Thanks again for doing the collaboration with me Beth:)!